We chose Shootantio as the the 1st winner of our 2nd contest because of the totally great, complete, detailed, and lengthy review entry post, very clean look, and great blend of design and content. In the beginning of this month, OurBlogTemplates.com are opening up a 2nd contest to showcase our blog there for a week. The closing date is October 31, 2008. For the complete information of this contest, you can see "OurBlogTemplates.com - 2nd Contest: Showcase your blog here". Formerly, OurBlogTemplates.com has been opened up an opportunity to all bloggers to showcase their blogs there at Ourblogtemplates.com in the beginning of September, 2008. The 1st contest has been closed at September 21, 2008. This review bellow have purpose to participate in the "OurBlogTemplates.com - 2nd Contest: Showcase your blog here", specifically review for design of OurBlogTemplates.com. 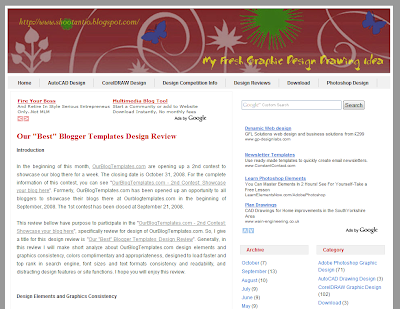 So, I give a title for this design review is "Our "Best" Blogger Templates Design Review". Generally, in this review I will make short analyze about OurBlogTemplates.com design elements and graphics consistency, colors complimentary and appropriateness, designed to load faster and top rank in search engine, font sizes and text formats consistency and readability, and distracting design features or site functions. I hope you will enjoy this review. Line elements in OurBlogTemplates.com design are right in their own places. There aren't find any problems with visualization of lines in OurBlogTemplates.com design. Shape elements in OurBlogTemplates.com design are good. As visually, OurBlogTemplates.com design have their own good shape and have good balance. Direction elements in OurBlogTemplates.com design are very proportional. Horizontal direction suggests calmness, stability and tranquility. Vertical gives a feeling of balance, formality and alertness. Oblique suggests movement and action. Size elements are very sufficient. The size area that occupied by one shape to that of another in OurBlogTemplates.com design have no problems. Texture elements in OurBlogTemplates.com design are very smooth and soft. Visual texture in there don't make user's eyes tired. Color elements in OurBlogTemplates.com design are very interesting. There are have good hue to catch user's eyes. Value elements in OurBlogTemplates.com design have sufficient lightness and also have adequate darkness of the color. There are have good tone. All of colors selection code above, build a good view and harmony that make user's eye will not tired in spite of long time duration seeing. For that reasons, we can say OurBlogTemplates.com layout design have good colors complimentary and good appropriateness. OurBlogTemplates.com don't have any distracting design features or any distracting site functions. This pronouncement will be proofed when you keep track of every part in OurBlogTemplates.com. Are OurBlogTemplates.com design elements and graphics consistent? Are OurBlogTemplates.com colors complimentary and appropriate? 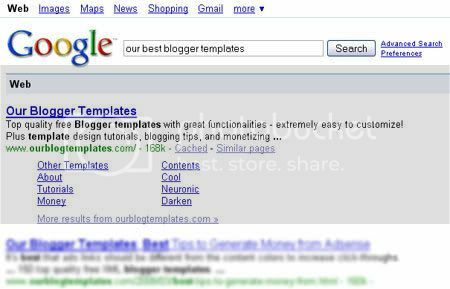 Is OurBlogTemplates.com designed to load faster and top rank in search engine? Are OurBlogTemplates.com font sizes and text formats consistent and readable? Are there distracting design features or site functions? OurBlogTemplates.com is one website that balances the beauty and the brains. Beauty being the nicely designed graphics, design elements and brains are the features, functionality and content. It is also important that OurBlogTemplates.com conveys professionalism with its design, because for many people, it's an important factor in reading and subscribing. Generallt, this review above analyze OurBlogTemplates.com's color combination, graphic sizes and placement, font sizes and colors, as well as its overall look and feel. Thank you very much.. I hope OurBlogTemplates.com will always provide "Our 'Best' Blogger Templates". I just want to congratulate you for being the First Winner in the contest. An apology for putting this message here, but I did not find another method of contact. u guys were 3rd listed in simple bloggr templates when isreached that uwere 3rd on the list out of 67 million! Great work.. I appreciate the effort behind this work.. Liked it..
bookmarked to take a gander at new stuff of your blog a certain prerequisite read blog. Having been searching this kind of particular information for a long time. Be grateful for you and all the best !. With the constant updates for iOS from Apple, vShare has evolved its support as well and you can safely install vShare for iOS 10.3 on your iOS devices with latest firmware. Jailbreaking iOS 10 has been largely unfruitful so far. I am quite interested in this topic. Hope you will elaborate more on it in future posts. This is very great and brilliant information.Thank you for sharing this nice post awesome keep sharing. This is one of the best post i have ever read. You represent the real situation. java collections interview questions In Java Collections are the group of objects represents a single entity.